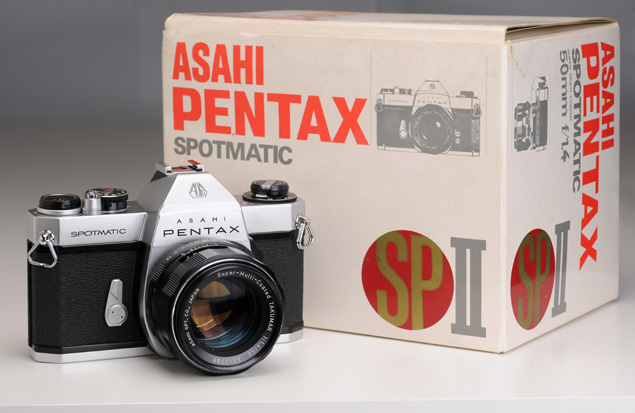 The Spotmatic SP II was released in 1971 and it was a slightly improved version of the SP, which appeared on the market five years earlier. 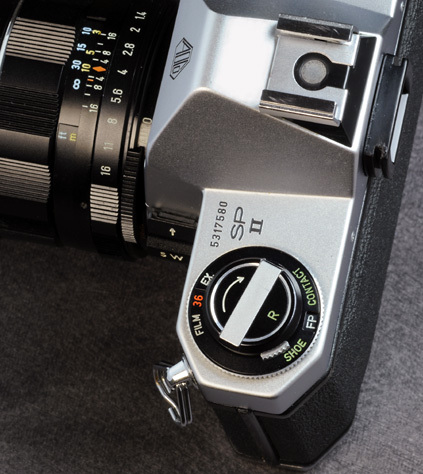 Improvements included a hot shoe on top of the prism housing and an extended film speed range for the light meter. The picture you see above was among the first ones I took when I started to document my camera collection and I was really pleased with the lighting effect. I admit it came about almost by accident. Nevertheless, about a year and many more set-ups later, this picture is still one of my favourites. 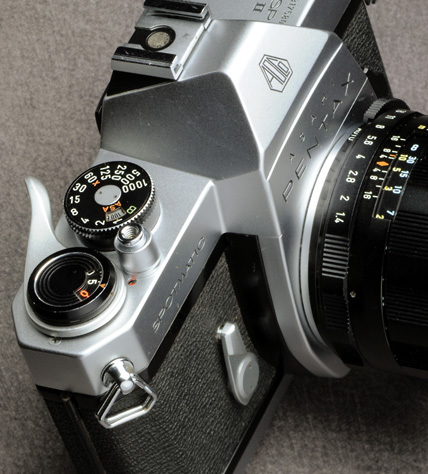 I think it exposes the elegance of this classic camera well. 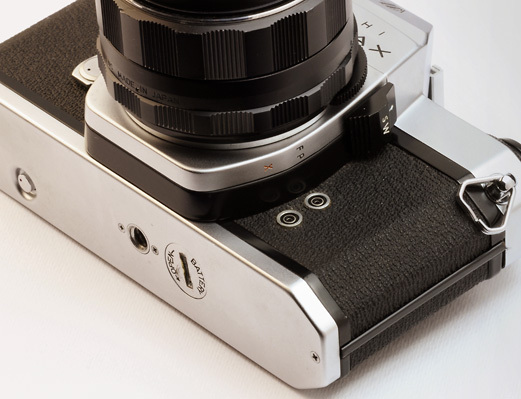 The Spotmatic SP II is also a joy to hold and use - if you appreciate simple, mechanical cameras. The Spotmatics were built with a CdS through-the-lens (TTL) light meter. However, on most models - including this one - measurement has to be done with the aperture closed down to the working aperture (i.e. stop-down metering). The black slider on the side of the mirror housing is used to achieve this. Pushing it upwards turns on the light meter and closes down the aperture. (I wonder what the SW stands for there... Would it be SWitch?) The twin CdS light sensors are behind the prism on either side of the viewfinder window. Contrary to what the name might suggest, the Spotmatics implement averaging light measurement, not spot measurement. On the left hand side of the camera we find a handy dial, which can be set to display the type of film loaded in the camera, or EMPT. if it is empty. This is purely a reminder, as this is not linked to anything. Also on the same dial, the type of flash synchronisation can be selected (FP or X). This, on the other hand, does affect how the flash works. The frame counter dial is on the right hand side. It shows the number of pictures already taken. The shutter speed dial goes from 1 sec. to 1/1000 sec. and there is B. The shortest sync. time with electronic flash is 1/60 - this speed was quite normal in the early 1970's, when this camera was marketed. The shutter release knob cannot be locked, so for long-time exposures a lockable cable release is recommended. There is also a not-so-common feature that I like - see the little circular window next to the shutter release knob? This turns red, when the shutter is cocked, otherwise it is black. The camera also has a self timer, as is evident from the picture above. 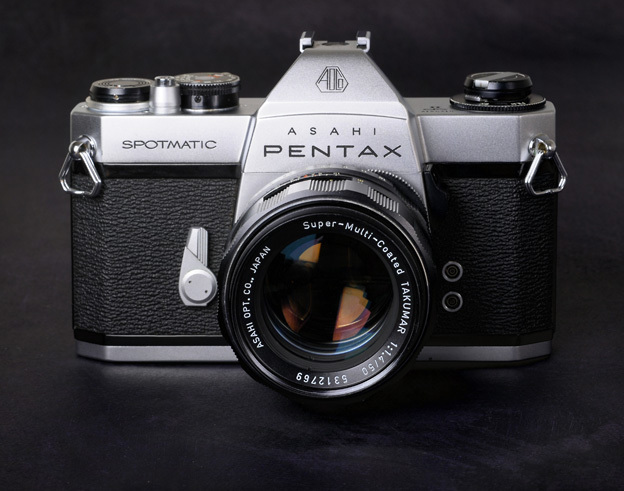 The Spotmatic SP II is a purely manual camera. A battery is only needed for the light meter. Unfortunately, the required 1.35 volt PX-400 Mercury battery is no longer made. Substitutes can be found, but the simple solution is to use an external light meter. (If this was an electronic camera, it would be totally useless without a suitable battery.) The battery compartment is on the bottom. So is the film sprocket wheel release knob that you press when you rewind the film. The viewfinder is not particularly bright, but good enough. With the standard lens, focusing is easy on the sufficiently large centre microprism spot or the matte field around it. Wide angle lenses (and to a lesser extent telefocus lenses) are somewhat harder to focus. The light meter's indicator needle is on the right hand side. When measuring the light, it should come to rest in a horizontal position for correct exposure. The disadvantage of stop-down metering becomes evident, when the background is dark and the photographer is using a small aperture. LEDs could have made the photographer's job easier, but they were not yet available. Ironically, by the time they became commonplace, cameras were already measuring light at full aperture. The camera back opens in the usual way by pulling up the rewind shaft. Film loading is not automated to any degree, but it is easily done. The rubberised cloth shutter curtain runs horizontally, as usual. All in all, this camera is simplicity at its best.